For some reason micro-moths (not a proper taxonomic group but a group of convenience) were well represented under my porch light the past two nights. Getting a clear picture of these 2 to 4 mm long moths is no easy task with a cellphone and some are just tantalizing blurs. Still, I recorded fourteen species of micro-moths which, with the exception of Diamondback Moth (Plutella xylostella, Family Plutellidae), a Leaf Blotch Miner Moth (Caloptilia stigmatella, Family Gracillariidae), and Many-plume Moth (Alucita montana, Family Alucitidae), and two species of Agonopterix (Agonopterix pulvipennella and Agonopterix atrodorsella, Family Depressariidae), are unidentified. There are two micro-moths, Mompha (Family Momphidae) and Parornix (Family Gracillariidae), identified to genus only because microscopic features are necessary for accurate determination. As for larger moths (macro-moths) six species were seen. They are Sigmoid Prominent (Clostera albosigma, Family Notodontidae), Powdered Bigwing (Lobophora nivigerata, Family Geometridae), Small engrailed (Ectropis crepuscularia, Family Geometridae), Bicolored Woodgrain (Morrisonia evicta, Family Noctuidae), Norman’s Quaker Moth (Crocigrapha normani, Family Noctuidae), and Large Ruby Tiger Moth (Phragmatobia assimilans, Family Erebidae). Morrisonia evicta, Crocigrapha normani, Ectropis crepuscularia, Phragmatobia assimilans, and Agonopterix atrodorsella are new records as are Mompha (M. luciferella?) and Parornix (P. obliterella? ), neither of which can be properly identified to species by visual inspection of gross morphology alone, thus bringing the moth checklist up to 204 species. Larval host plants: A large variety of woody plants including blueberry (Vaccinium), cherry (Prunus), chokeberry (Aronia), dogwood (Cornus), and hazel (Corylus). Range: Northeastern US to Georgia and North Carolina and southern Canada. Scattered reports from Montana, Florida, and Texas. Larval Host plants: ash (Fraxinus), aspen (Populus), birch (Betula), cherry and plum (Prunus), oak (Quercus), mountain ash (Sorbus), elm (Ulmus), and willow (Salix). Range: Northeastern US to Georgia and South Carolina and in southern Canada. Larval Host plants: balsam poplar (Populus balsamifera), raspberry (Rubus), and paper birch (Betula papyrifera). Larval Host plants: balsam fir (Abies balsamea), hemlock (Tsuga canadense), larch (Larix), spruce (Picea), apple (Malus), alder (Alnus) and many other tree and shrub species. Range: Over much of North America and in Eurasia. Larval Host plants: joe-pye weed (Eupatorium), beggars ticks (Coreopsis and Bidens). Range: New England, Great Lakes Region, Quebec, Ontario, New Brunswick, and few locations in Kentucky, Maryland, and North Carolina. Species accounts at Bug Guide, BAMONA, HOSTS, and Moth Photographers Group. I’ve never heard the term micromoth. I have seen them, but I’ve never paid much attention to the different species, just larger moths and butterflies. I’ll have to start taking a closer look! Thanks for sharing. You’re welcome. Technically “micro-moth” is not a real taxonomic group although there is the Micropterigoidea which is a group of primitive and very tiny moths whose larvae feed on mosses and liverworts. The term is more one of convenience when trying to sort out species. 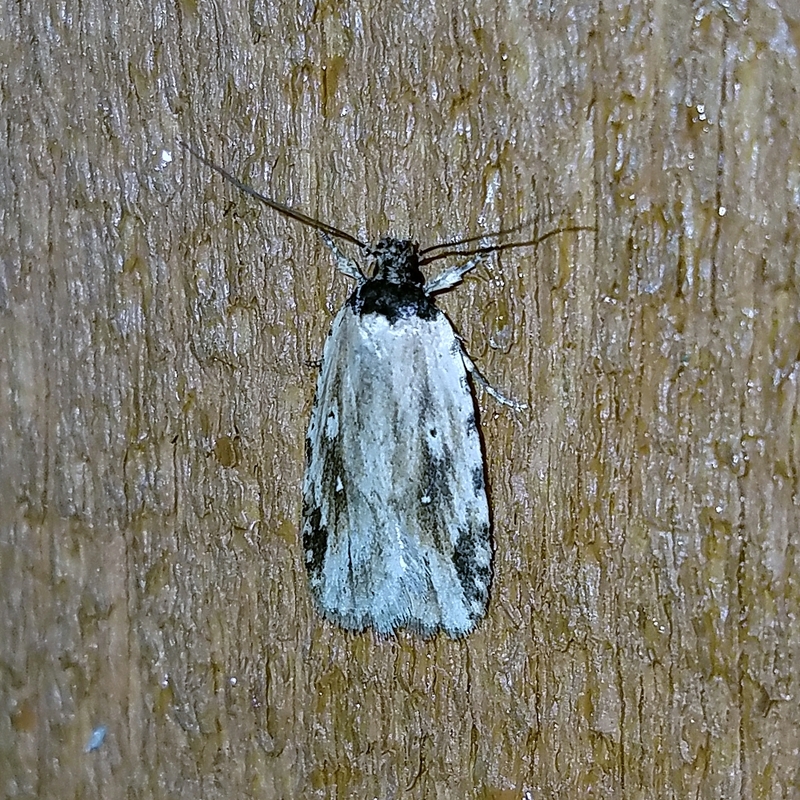 I’ve been out mothing again this weekend and have more of these tiny moths. Check out the Moth Photographers Group plate series (http://mothphotographersgroup.msstate.edu/slow.php?plate=01&size=s&sort=h). These tiny moths are often beautifully colored. Good luck in your searches! We go microfishing in our pond, we catch baby bream, catfish and bass…cool to see the term applied to moths. Microfishing! That’s good. All we have in our stream are microfish like darters and mudminnows. Used to have larger fish like white suckers but they haven’t been around for years.